Capt Villa is the Chief Navigator for RC/TC/OC/WC-135, 55th Operations Group, 55th Wing at Offutt Air Force Base, Nebraska. He is responsible for the standardization and evaluations for more than 2,400 aviators in 42 different crew positions across five different aircraft types and serves as the 55th Operations Group’s navigator subject matter expert for flight operations, technical orders, publications and local procedures. Capt Villa was born and raised in central Minnesota. 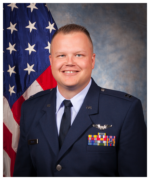 In 2010, he graduated from the University of Minnesota, Minneapolis, Minnesota with a degree in computer science and was commissioned through the Air Force ROTC, Detachment 415. Capt Villa was the deployed Director of Operations from 15 February 2018 through 15 April 2018. He led the newest COBRA BALL aircraft capability for the first time in an operational environment and a 50-member team who was on standby to deploy worldwide, postured from the Pacific Command Area of Responsibility (AOR) to collect intelligence on missile launches. Capt Villa’s team demonstrated superior airmanship, resolve, and flexibility while executing intelligence, surveillance, and reconnaissance operations, as directed by the President of the United States, the Secretary of Defense and the Joint Chiefs of Staff (JCS). Capt Villa deployed to three Forward Operating Locations within Pacific Command and Central Command and flawlessly supported 20 Higher Headquarters missions, tasked from JCS staff directly. During these missions, his team collected seven National Intelligence Priorities Framework (NIPF) priority one missile launches, which were briefed directly to the President. A rapid deployment and re-deployment posture allowed the team to collect from all three locations with 100% success. The mission-first mentality of Capt Villa ensured collection of four NIPF priority one missile launches within the first four missions, which is a remarkable feat for collection of TBMs and associated weapons systems. From the Central Command AOR, Capt Villa miraculously collected two short-notice, unique TBM weapons of opportunity. Capt Villa’s awards include the Aerial Achievement Medal (3 Oak Leaf Clusters), Air Force Commendation Medal (1 Oak Leaf Cluster), Air Force Achievement Medal, and the Combat Readiness Medal (1 Oak Leaf Cluster).